Not On The Highstreet is a fabulous online shopping destination for unique and personalised gifts. I love spending the time to choose the perfect gift for someone. With such a diverse range of products and sellers, Not On The Highstreet is the ideal site to find that something special. I really like that there are more well known indie brands selling their wares alongside smaller crafters and businesses. I was very kindly gifted a make-up bag* from Alphabet Bags, a bicycle print scarf* from Lisa Angel and dove hanging decoration* made by the fantastic Rachel Pettitt Designs by the lovely people at Not On The Highstreet. What I love most about Not On The Highstreet is the option of personalising the items. Rachel Pettitt's adorable shabby chic gifts can be tailored especially for the recipient (or yourself, if you're being naughty)! 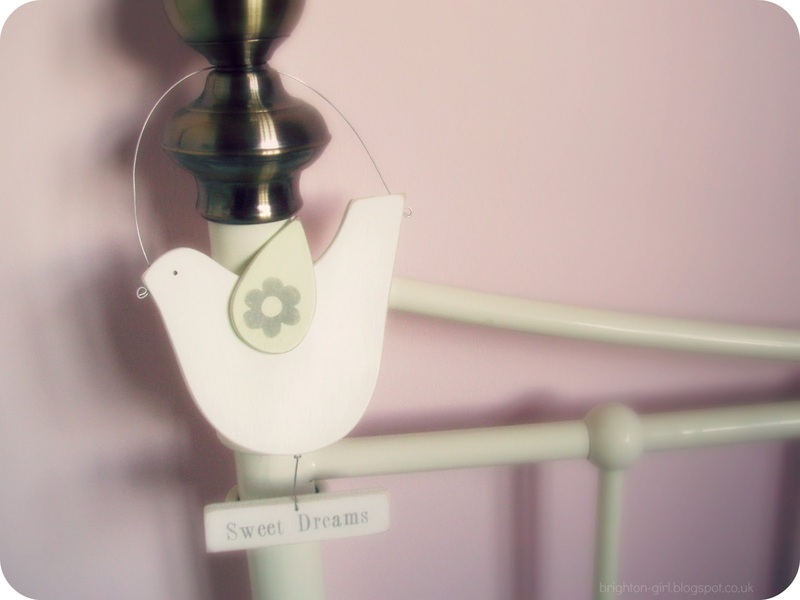 I chose the lovely dove hanging decoration with a light, sage green wing and the words 'Sweet Dreams' dangling below him. As soon I laid my eyes on him, I knew he would be perfect for hanging on my bed frame. The option of personalisation really comes into it's own when you're browsing for wedding or new baby gifts. After seeing my dove and the other customisable gifts available, my Mum has been trawling the site for a new baby present. Safe to say that she's still undecided because there are so many wonderful items to choose from! 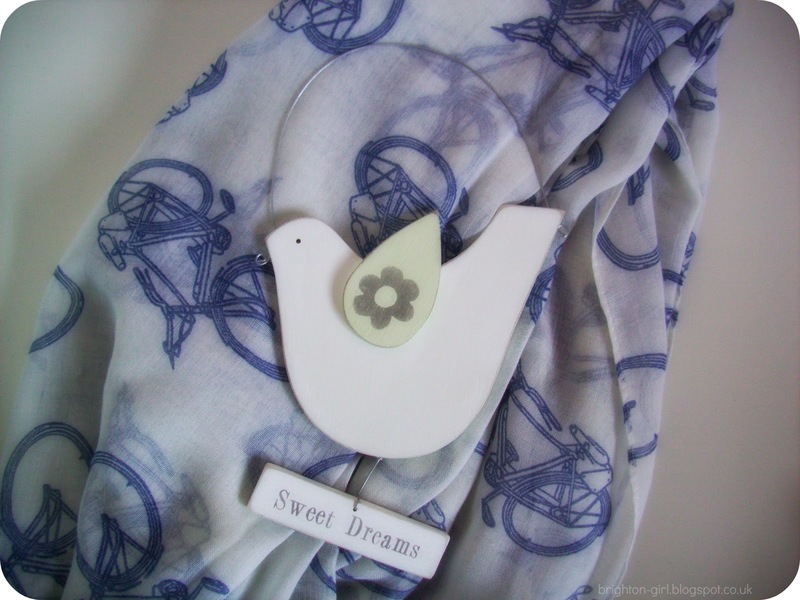 It wasn't only my little dove who jumped out at me, but the bicycle print scarf too. The bold, quirky print drew me to it straight away. A lightweight scarf is the perfect accessory for spring and I know I'm going to be wearing this constantly over the coming months. I'd been intrigued by Alphabet Bags' selection of totes and make-up bags as I'd seen a few popping up on different blogs. 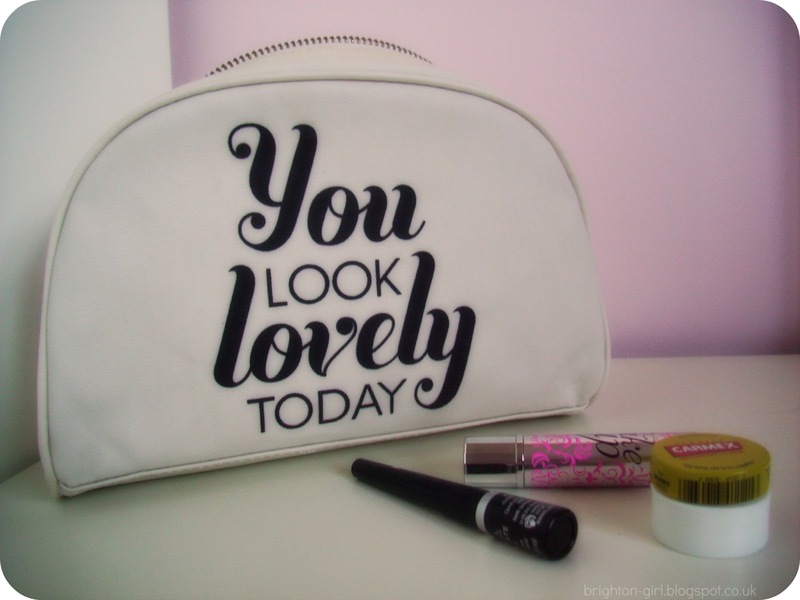 I absolutely love that my new make-up bag compliments me every morning! I adore the simplicity of Alphabet Bags' designs and certainly indulged my inner typography geek as I browsed their products. The make-up bag is such a great size too. It's deceptively big and houses all of my everyday cosmetic essentials with room to spare. The perfect excuse to go beauty shopping! I have to give a mention to the pretty packaging these products came in. It was enough to make me swoon even before I'd opened the parcels! Cute envelopes and adorable stickers may not get everybody as excited as they make me, but how can you fail to be happy when the post man hands you a jiffy bag adorned with a cute sticker saying "hello"?! (Just me? never mind..) All the items came quickly too, although expect items that are customised to take a little longer. Have you shopped at Not On The Highstreet before? *All items mentioned in this post were chosen by me, but gifted by Not On The Highstreet. All opinions remain 100% my own. I recently came across the Not on the Highstreet website and was amazed at all the lovely and quite unusual items they have! Instant love! Such pretty things, will definitely have a look at this! 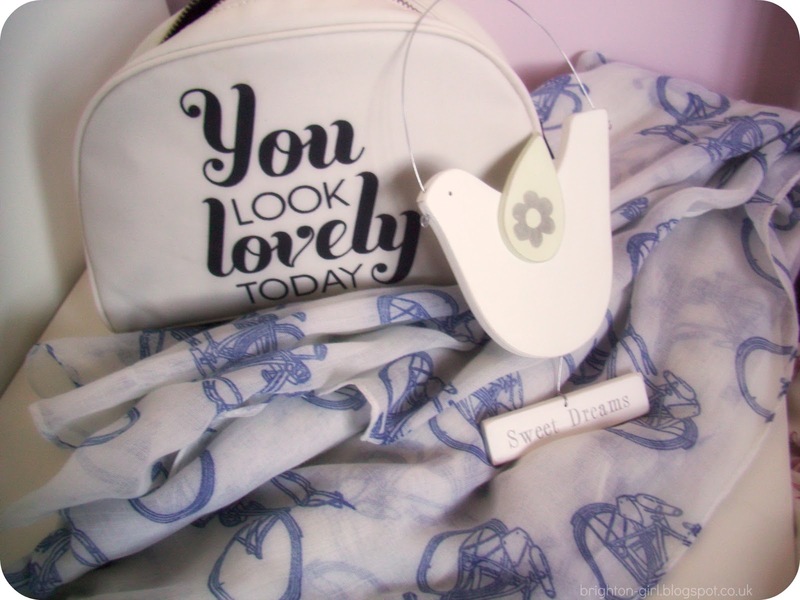 LOVE the bicycle scarf & make up bag! You have SUCH great taste!